The New Leaf Gardens grew from a long needed career change. After spending 20 years in corporate America as an I.T. professional, it was time for a change. It was time to turn over a New Leaf, so to speak. Located high in the foothills surrounding Wenatchee, New Leaf is a small vertical farm specializing in craft agriculture. Leveraging a passion for food, cultivating fresh ideas, and healthy living, my goal is to supply the local community with creatively cultivated, specialized, small batch produce. Petite yet powerful, Microgreens are a nutrient packed addition to any meal. As a colorful component of your garnish, or as the star of the dish, my wife & I have found countless uses for the diverse array of cultivars I grow in the New Leaf Gardens. The Microgreens are delivered to you live, giving you the freedom to harvest as you need them. As part of the partnership, I will gladly provide the necessary level support and infrastructure, potentially allowing you to have an onsite New Leaf mini-micro-farm-extension. It goes without saying that this unique feature of the New Leaf service model will help to reduce your "farm-to-table" distance. When it comes to Microgreens for culinary use, New Leaf can help get your Farm to Table distance down to a length measured in feet as opposed to miles. Located at an elevation of 3,400 feet, in a North facing canyon, our backyard is a hostile growing environment much of the year. Needless to say, the vast majority of the cultivation magic happens indoors. The goal is to keep it small, efficient, and ultra-local. My primary focus as a micro gardener is the creative use of vertical space. The garden is integrated with our living space and is designed to scale effortlessly (grow or shrink) in either direction. 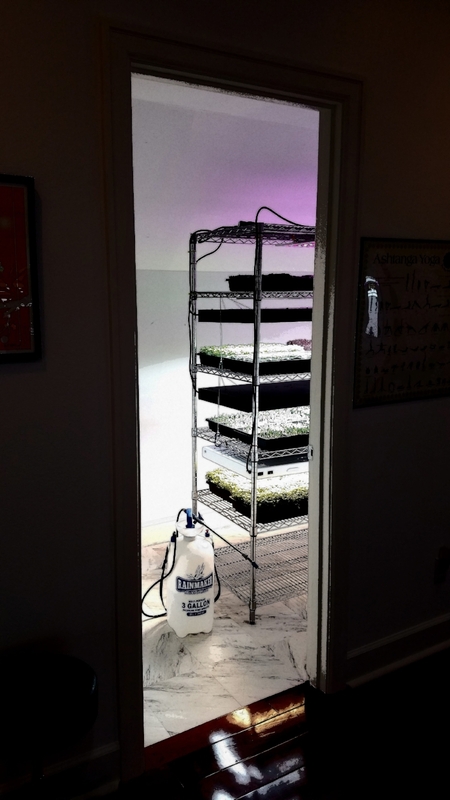 The Micros are grown both in soil and hydroponically, under a combination of natural and artificial lighting. Custom cultivation is a service tailored for the Culinary market. Our goal is to build tight-knit relationships with our region's culinary artists. The service is as simple as it sounds. If it is a suitable candidate for micro production, I will grow it for you. Working together, I will manage production, delivery and support schedules from start to finish. Think of custom cultivation as a tool to enhance your creativity. This service will provide you access to cultivars that are not often offered by mass production operations. I believe that effective micro-farming requires a "less is more" approach. New Leaf Micros are a small batch live product, available to a limited number of clients. This is not mass production. The system and service are uniquely designed to supply a fresh, living, locally cultivated product to the culinary community. Let me know if you have something uniquely micro in mind, and we can plan out the steps needed to make it happen. Our Microgreens are good to go anytime and anywhere. Conveniently packaged and hydroponically grown in 5x5 inch vented containers, our Microgreens are as portable as they are nutritionally dense. With a small drink of water every other day or so, they will live and grow in the refrigerator for up to 10 days. You harvest and eat them at your convenience. It doesn't get any fresher than that. The typical harvest from one package is about 2 ounces of fresh Microgreens. A small salad for 2 can be created using about 6 ounces of Microgreens. For example, start with 1 package of arugula, add some broccoli, and finally, sweeten it up with some basil. Mix it up, add some oil and vinegar, and in a matter of a minute or two... You have an ultra-fresh micro-salad! Look for the New Leaf product line in coolers at fresh markets and health food stores throughout central and western Washington. To be perfectly honest, I am not a fan of "Social Media." There is a Facebook Page, but I probably won't maintain it. There will be no tweeting about the latest developments in the Garden. There will be no tweeting period. Call me old-fashioned, or maybe just Old, but I prefer face-to-face relationship building. My schedule is flexible. Let's get together and discuss food philosophy. I will bring along live samples.